First announced in November 2005 is the book by "comedian" Sammy Shore entitled "The Man Who Made Elvis Laugh" The book is due for release August 2008. 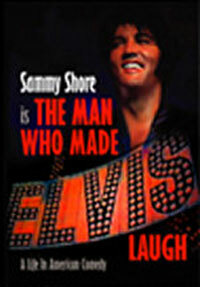 Sammy Shore was chosen by Colonel Parker to open for Elvis from 1969-1972 in Las Vegas. He also opened the Comedy Store on the Sunset Strip and is the father of famous comedian Pauly Shore. A comedian by trade, Sammy has also appeared in many television shows, including Coach, The Munsters and Sanford and Son. Wow, what a shot on that cover! I hope there are more like that on the inside.